Aaron Daniels is the pen name of a fantasy author. Under his other name, he’s written numerous short stories for magazines and anthologies. He’s also written four full-length novels and a short book of tips for authors. Now if you can only figure out his other name. Maybe he’ll out himself. Michael Crane is a short story writer whose short story collection In Decline we reviewed here. He also has a novelette, A Gnome Problem, reviewed here. For years they’ve been “man’s best friend.” They’re cute and cuddly. Who doesn’t love a puppy? But what if these adorable creatures grew tired of sucking up to us for our attention and table scraps? 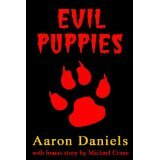 You’d have Evil Puppies, seven short stories from Aaron Daniels plus a bonus story from Michael Crane. Depending on your definition, at an average story length of fewer than 400 words, Evil Puppies probably falls within the classification of “flash fiction.” In previous reviews I’ve discussed my attitude about short stories and how that attitude has changed. Flash fiction condenses the short story form even more. Taken on those terms, flash fiction in general, and Evil Puppies specifically, is a lot of fun. If there is such a thing as comedic horror, I found it here. The premise is both ridiculous (those adorable little things wouldn’t really turn on us … would they?) and horrifying (imagine if they did). Daniels’ wide-ranging stories on this theme run from the horrific, full of blood and guts, to laugh-out-loud-funny. The characters run from Elvis and Hitler to a normal guy and gal making out at the beach. Before the premise becomes shopworn, Evil Puppies ends with a boom. Michael Crane also has two flash fiction collections available. These are “drabbles,” a special form of flash fiction where each story is exactly 100 words. I won’t repeat here the reviews I’ve already posted to Amazon, but you can check them out if you’re curious. The first is Lessons (and other morbid drabbles), which has twenty of these flash fiction pieces. The sequel, Lessons II: Another Morbid Drabble Collection, has twenty-five more. Lessons III: A Bunch More Drabbles, is rumored to be in the works. An additional draw of flash fiction for me is the craftsmanship. If you work with words in any context, you can’t help marveling at how the best of the genre packs so much information in such little space, not unlike the best song lyrics. I'm intrigued. Evil puppies? It's hard to look at a little puppy and see evil. I've gotta check this out. Thanks for bringing it to our attention. I was thinking this might be something like that cat horror anthology, Twist of the Tale or something like that. I got a sample and I see what you mean about snacks vs meals. Not badly written, but nothing in the first story to get into. I love flash fiction, so I'll have to check this out. I would argue that a novel is more like a three course meal. You have to eat it slowly and enjoy it. A short story is more like a one course meal. You can get the whole thing down in one sitting. Flash fiction, a snack to tide you over.